Another GPS program that works on Boost iDEN phones but not the CDMA models. Review/export your tracks at www.trackthisout.com/tm.html. This part is password protected. Your current location is pincode protected. In this way friends can track you if you give them your pincode. Also works without GPS. In that case you can browse maps and use the find-feature. This is an unlimited demo version. However without license key, each 90 minutes you have to restart the application and you have an extra popup at startup. On my i776 NavFunPro installed OK and gets a fix quickly but after a couple of minutes it complains “location signal lost” and locks up tight. arnold040 says it works pretty well on his i580 although he gets the “location signal lost” message occasionally. This app have vxp files. does it work with androids? No, NavFunPro doesn’t work with Android phones. 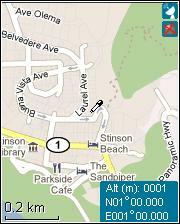 Google Maps, Drive and Latitude, which come with Android phones, do everything NavFunPro does and do it better.